James Brien "Jim" Comey, Jr. (born December 14, 1960) is an American lawyer. 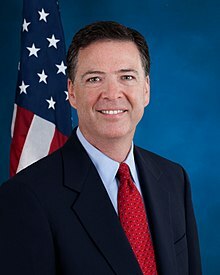 He was the 7th Director of the Federal Bureau of Investigation (FBI) from September 4, 2013 until May 9, 2017 when he was fired by President Donald Trump. Comey was the U.S. Attorney for the Southern District of New York from January 2002 to December 2003, and later, the United States Deputy Attorney General, from December 2003 to August 2005. As Deputy Attorney General, Comey was the second-highest-ranking official in the United States Department of Justice (DOJ), and ran its day-to-day operations. Comey was born in Yonkers, New York. He grew up in Allendale, New Jersey. He graduated from the College of William and Mary in 1982, majoring in chemistry and religion and later from the University of Chicago with a Juris Doctor. In September 2013, Comey was appointed Director of the FBI by President Barack Obama. Comey was responsible for overseeing the FBI's investigation of the Hillary Clinton email controversy. His role in the 2016 U.S. presidential election, particularly with regard to his public communications, was highly controversial. His decisions have been regarded by many analysts, including Nate Silver of FiveThirtyEight, to have likely cost Clinton the election. Comey was fired by President Donald Trump on May 9, 2017 reportedly days after Comey asked increased funding from the Justice Department for the FBI's investigation into Russian interference in the 2016 United States elections. The Justice Department called the New York Times report that Comey asked for more funding "totally false". In a statement by the White House, they released a statement saying that "removing Comey will help bring the Russia investigation to end" quickly and rapidly, and that it would be ended soon. Comey and his wife Patrice Failor are the parents of five children. He was raised in a Roman Catholic household. Comey was a member of the Republican Party until 2016 when he announced that he was an Independent. ↑ "Himes Congratulates Westport's James Comey as New FBI Director". Congressman Jim Himes website. July 31, 2013. Retrieved July 25, 2016. ↑ Silver, Nate (May 3, 2017). "The Comey Letter Probably Cost Clinton The Election". FiveThirtyEight. Retrieved May 3, 2017. ↑ "Justice Department denies report Comey requested more funding for Russia probe". Retrieved May 11, 2017. ↑ Wang, Christine. "Comey reportedly asked for more resources for Russia probe; DOJ calls reports 'totally false'". CNBC. Retrieved May 11, 2017. ↑ Neill Caldwell, Next FBI director is a United Methodist, United Methodist News Service (July 31, 2013). ↑ Profile, northjersey.com; accessed October 5, 2014. ↑ Profile, irishcentral.com; accessed October 5, 2014. "Corporate Counsel article - "Attention Must Be Paid"". law.com. January 1, 2008. This page was last changed on 28 December 2018, at 06:44.